dynamic, and progressive places for people to live, work, and play by standardizing on Adobe solutions. 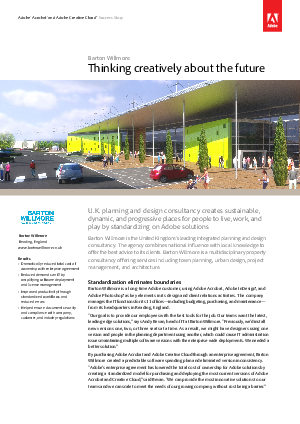 Barton Willmore is the United Kingdom’s leading integrated planning and design consultancy. The agency combines national influence with local knowledge to offer the best advice to its clients. Barton Willmore is a multidisciplinary property consultancy offering services including town planning, urban design, project management, and architecture.